Physical Reality: First, the 27 cubes were designed on paper, meant to act as a catalyst in the physical world for people to build stories the way children build castles out of blocks. 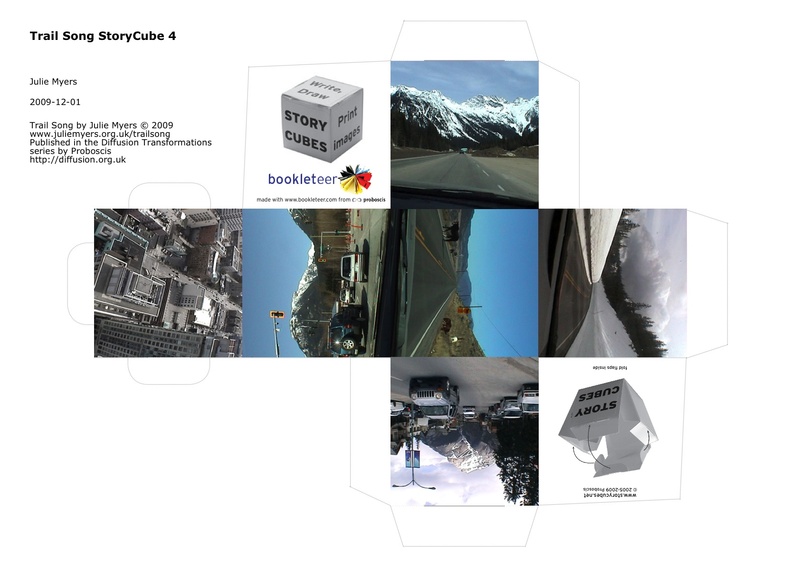 I thought it would be fabulous if people could make the cubes tremendous or tiny to show the signiﬁcance of each element in the overall scene of the story created anew each time the cubes are approached. In the physical world, the cubes remain stubbornly one size ﬁts all. You can’t make some of them disappear into the ocean while others ﬂoat in the sky. 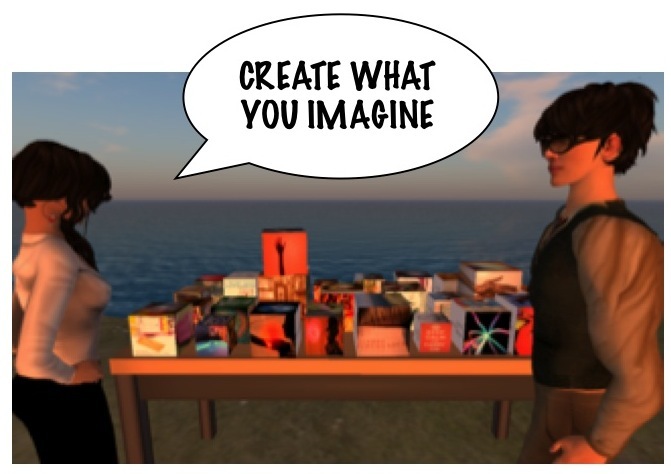 That can only be accomplished in the virtual world, so that’s where I went next. Augmented Reality: Lately, my company, Dancing Ink Productions, has been working in the ﬁeld of “augmented reality,” which goes a step beyond “virtual reality” by changing the fabric of one’s immediate perceptions in the physical world. Reality is becoming a multilayered collage. 26 of the cubes correspond to letters of the Roman alphabet from which stories are told. The 27th cube has no corresponding letter, so instead, it activates the possibility for a whole new realm of understanding through an Augmented Reality marker printed on it. 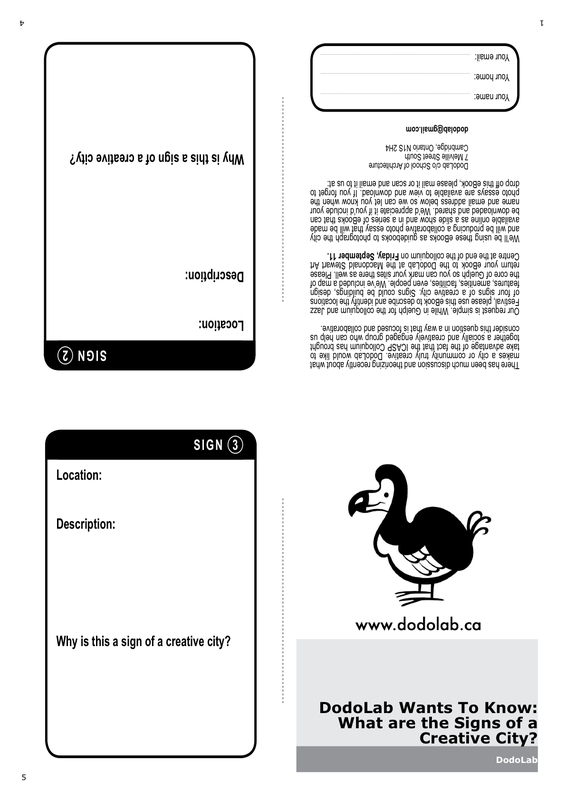 If you have a webcam, you can print this Augmented Reality marker out and activate the webcam at the following site: www.1000inchesinloveland.com to see the 27th cube create a new reality. “Welcome to the Imagination Age,” documents some of the main ideas behind a worldwide collaborative movement toward a new global culture and economy in the Imagination Age. If this message of transformation speaks to you, consider it an invitation to join the experiment. Follow @RitaJKing on Twitter and ping me..
Rita J. King is CEO and Creative Director of Dancing Ink Productions. Creator of The Imagination Age. Innovator-in-Residence, IBM Analytics Virtual Center. Senior Fellow for Social Networking and Immersive Technologies at the Center for the Study of the Presidency & Congress, and a Senior Fellow at the Carnegie Council for Ethics in International Affairs, where she collaborated with Joshua S. Fouts on the “Understanding Islam through Virtual Worlds” project that spanned four continents as well as the digital culture. Investigative reporter, essayist, artist and adventurer. About : A practical, step-by-step guide to using empty spaces for arts and community projects – and while empty shops are a focus, the skills can be applied to other temporary and meanwhile projects. 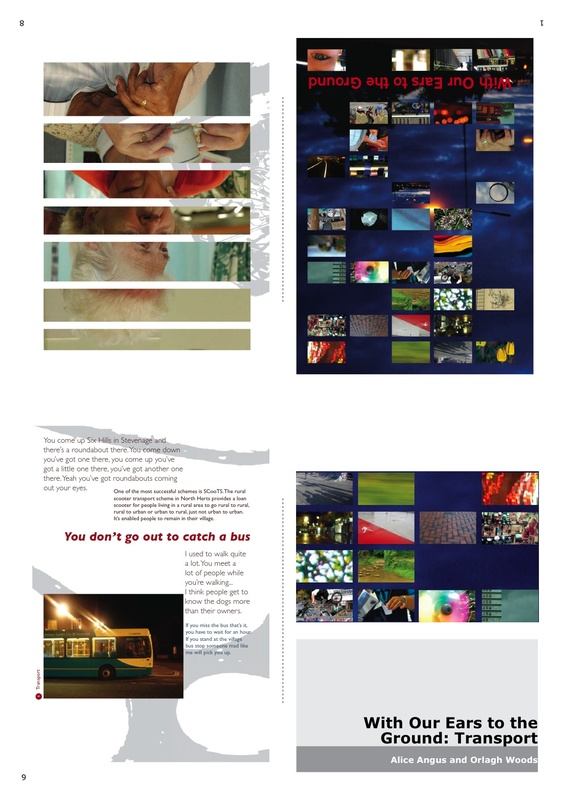 Produced by the Empty Shops Network with support from the Meanwhile Project and a-n magazine. 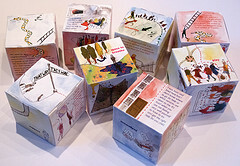 About : A series of StoryCubes created by Alice Angus and Orlagh Woods of Proboscis, specially commissioned for the Early Intervention strand of Birmingham Total Place, including a set of 8 designed to bring the everyday voices of families, parents and carers into the BTP conference, and a StoryCube designed to elicit responses from the conference participants. About : Printed in an edition of 100 as a giveaway and designed by Julia Scheele from We Are Words & Pictures for the Modern Romance event held on February 14th 2010 at the Notting Hill Arts Club. About : A Short Film about War is a narrative documentary artwork made entirely from information found on the worldwide web. In ten minutes this two screen movie takes viewers around the world to a variety of war zones as seen through the collective eyes of the online photo sharing community Flickr, and as witnessed by a variety of existing military and civilian bloggers. See the film at animateprojects.org. A Short Film about War was developed with help from New Media Scotland and Alt-w. Script by Jon Thomson, Alison Craighead & Steve Rushton. Essay by Lisa Le Feuvre. 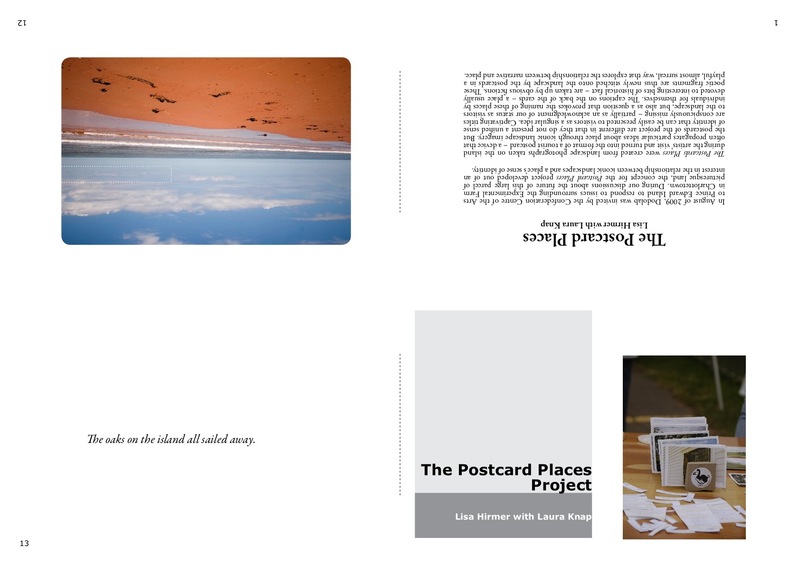 Lisa Le Feuvre is a curator and writer based in London. She is Senor Lecturer in the Department of Art at Goldsmiths. 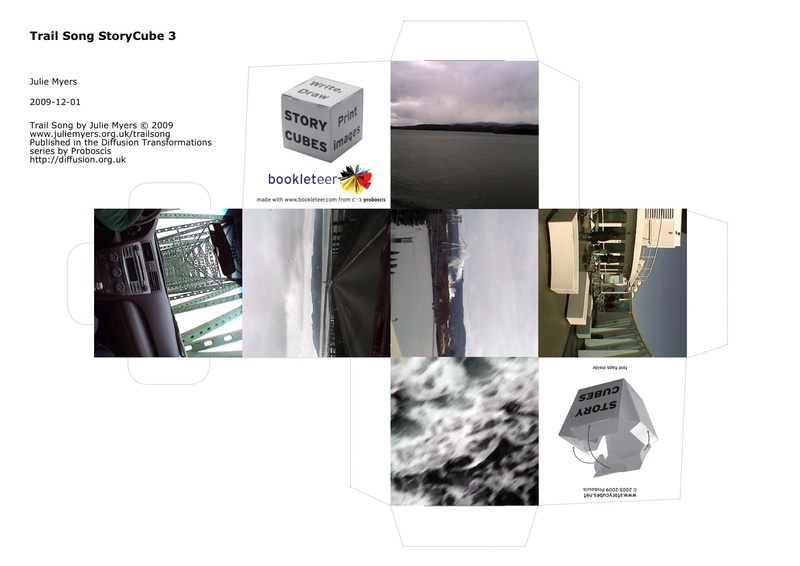 Between 2005 and 2009 she directed the contemporary art programme at the National Maritime Museum, commissioning work by Dan Holdsworth, Esther Shalev-Gerz, Lawrence Weiner, Simon Patterson, Renée Green and Jeremy Millar. In 2009 she curated the exhibitions Joachim Koester: Poison Protocols and Other Histories at Stills, Edinburgh and Economies of Attention from the Arts Council of England Collection. 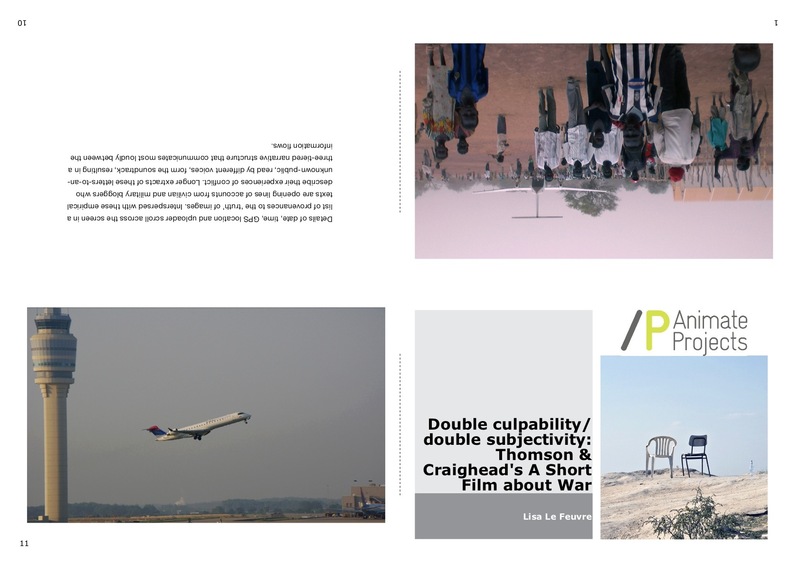 In 2010-11 she will co-curate with Tom Morton British Art Show 7 and edit Failure, published by MIT Press / Whitechapel Art Gallery. 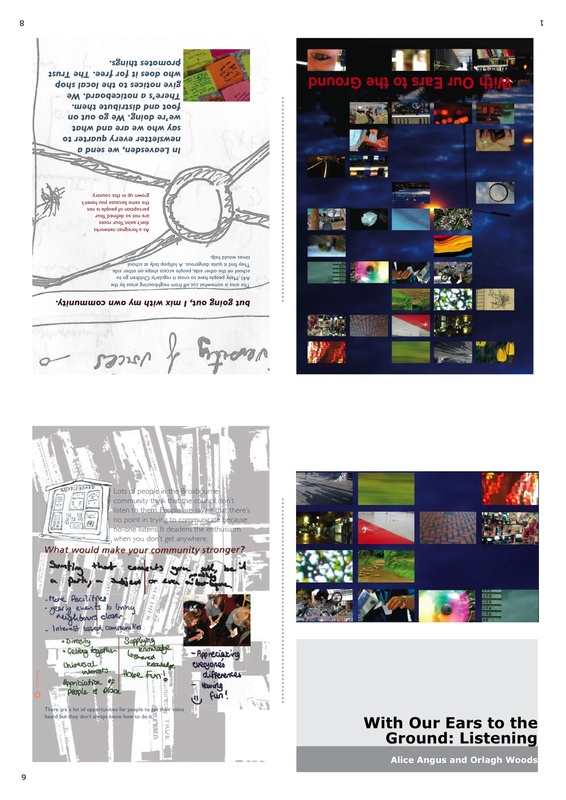 About : These 6 eBooks comprise a downloadable version of an artists’ bookwork created by Proboscis for Green Heart Partnership with Hertfordshire County Council. 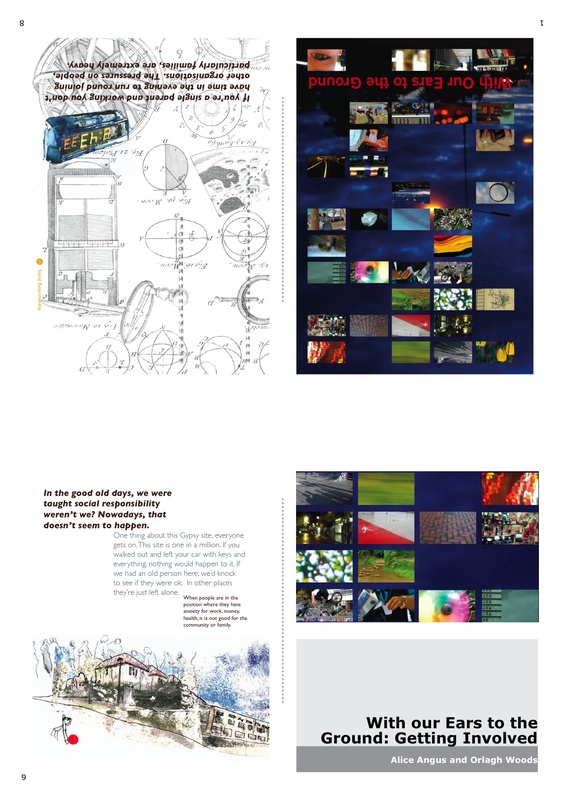 Proboscis were commissioned to explore peoples’ ideas about community in four very different geographic communities to get a broad range of opinions across the county: in Watford, Stevenage, rural North Hertfordshire and the commuter areas of Broxbourne. The project focused on finding out the reasons why people get on with each other and feel part of the community and, developing a better understanding of our communities in order to help Hertfordshire County Council and its partners to plan their work supporting communities over the next few years. 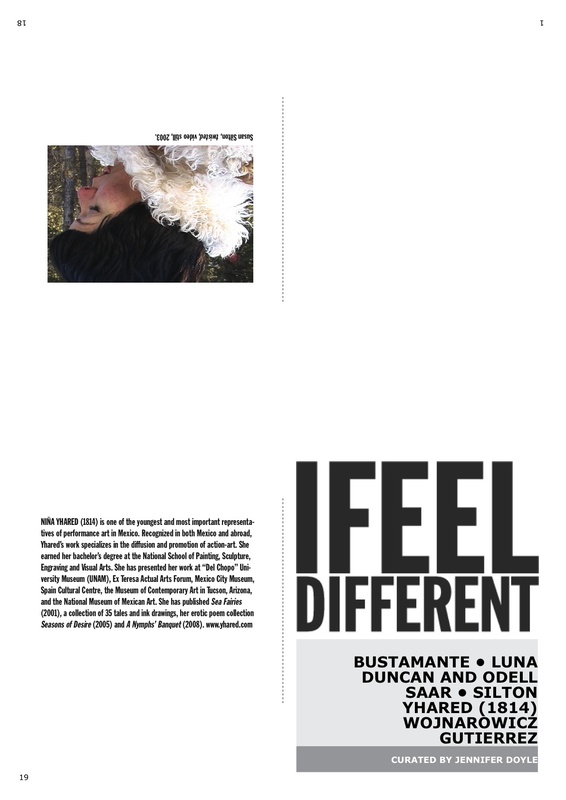 About : I Feel Different is a provocative multi-media exhibition that explores both the experience of feeling different from others and the transformational power of art to make one feel differently. 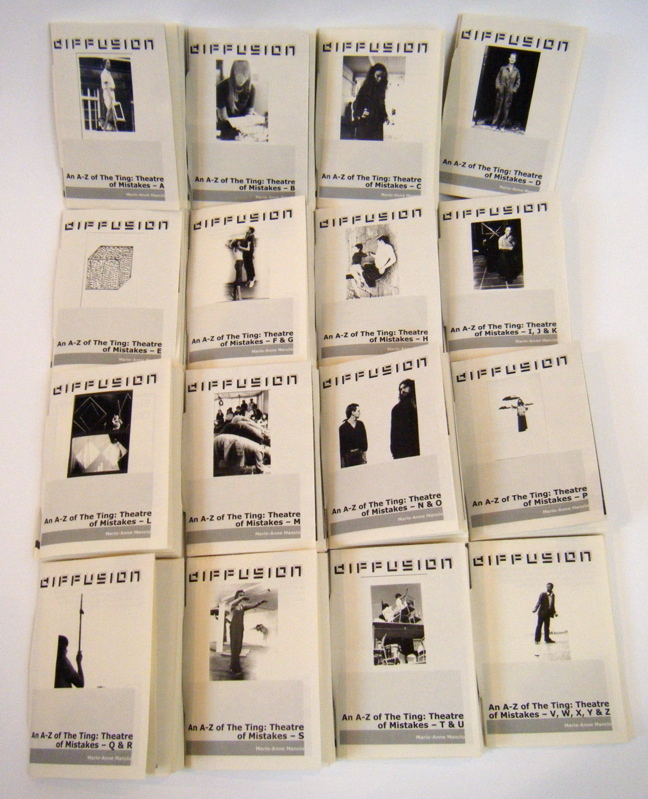 Featuring Nao Bustamente, James Luna, Monica Duncan and Lara Odell, Lezley Saar, Susan Silton, Nina Yhared (1814), David Wojnarowicz and Raquel Gutierrez. Curated by Jennifer Doyle and on view at LACE through 31 January 2010. LACE (Los Angeles Contemporary Exhibitions) both champions and challenges the art of our time by fostering artists who innovate, explore, and risk. LACE moves within and beyond its four walls to provide opportunities for diverse publics to engage deeply with contemporary art. In doing so, it furthers dialogue and participation between and among artists and those audiences. 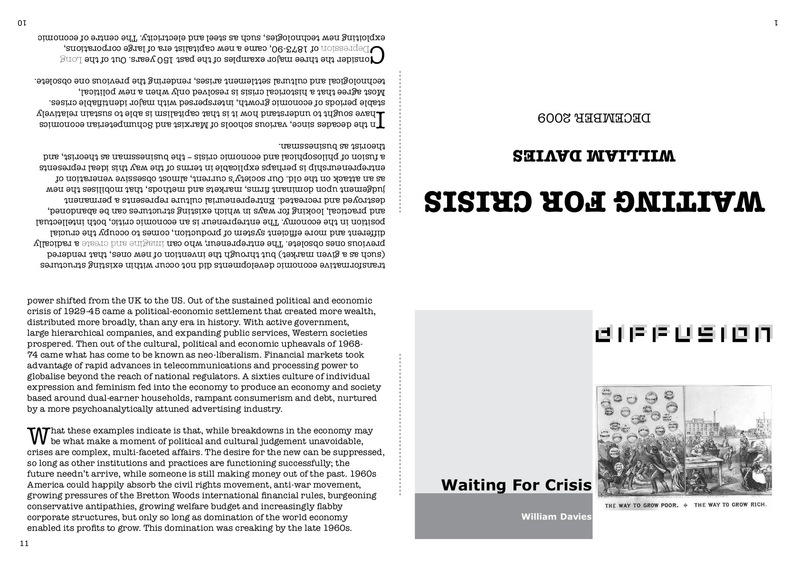 About : The financial crisis promised a new chapter in political and economic history. But this appears to have been delayed. Modern consciousness is shaped by the notion of crisis, which the idea of ‘post-modernity’ then threw into doubt. But now, as we grow bored of the banality of change and financial uncertainty, and fearful of our inability to respond to disasters, we are waiting for a crisis to finally go critical. 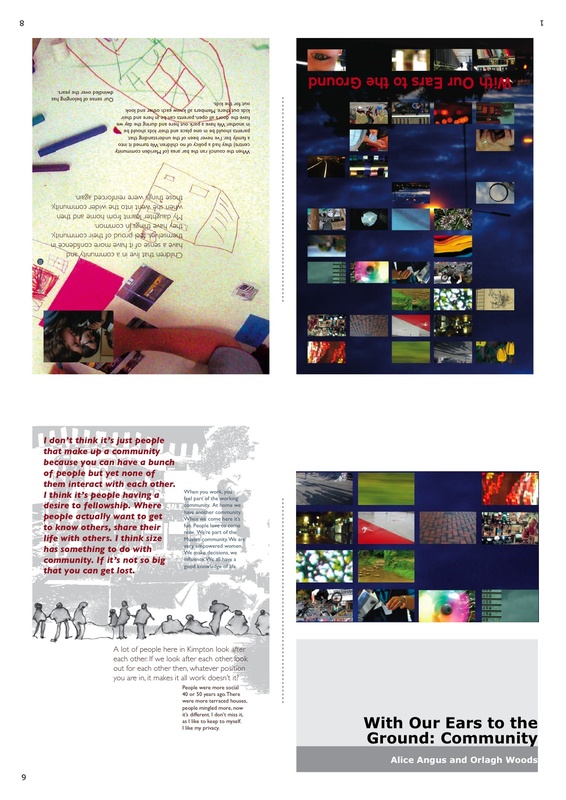 About : These two eBooks were created by Matthew Sheret at the first bookleteer Pitch Up & Publish event in October 2009. 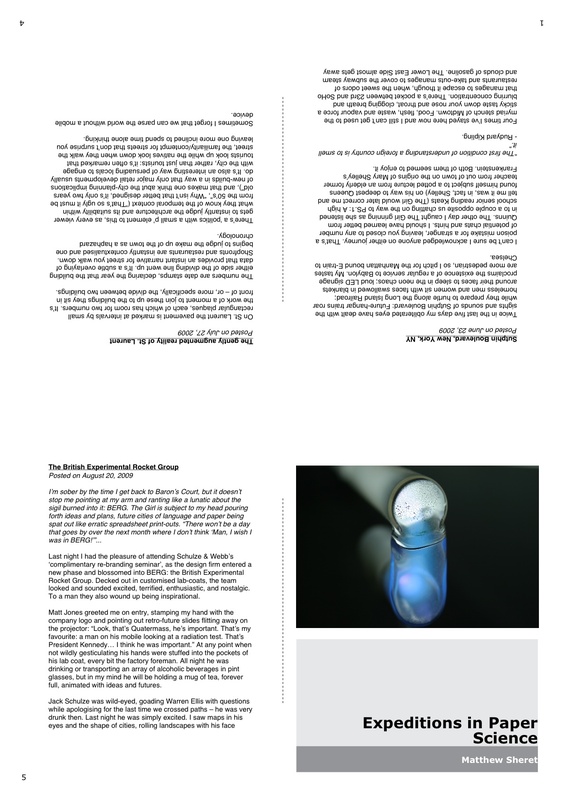 Matthew writes, “Expeditions in Paper Science was my first pass at the system, a reasonably off-the-cuff collation of some of my blog entries this summer. I’ve long been interested in the idea of physicalising web articles, and while an industry has solidified around POD in the last few years they remain a step removed from the immediacy I’m itching for. 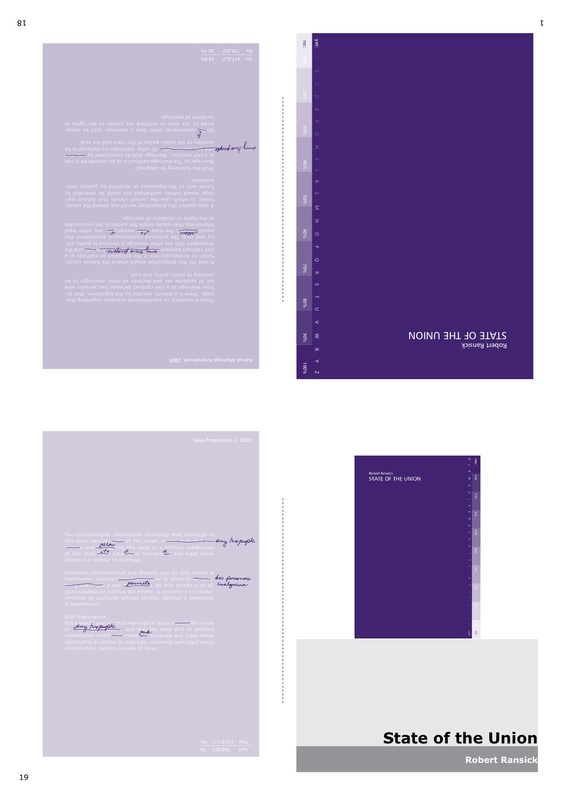 Bookleteer instantly unlocked that; simple cut-‘n’-paste gave me a nice little document I’ve been throwing around since. “The speed of delivery got me thinking about incorporating illustrations into the format. 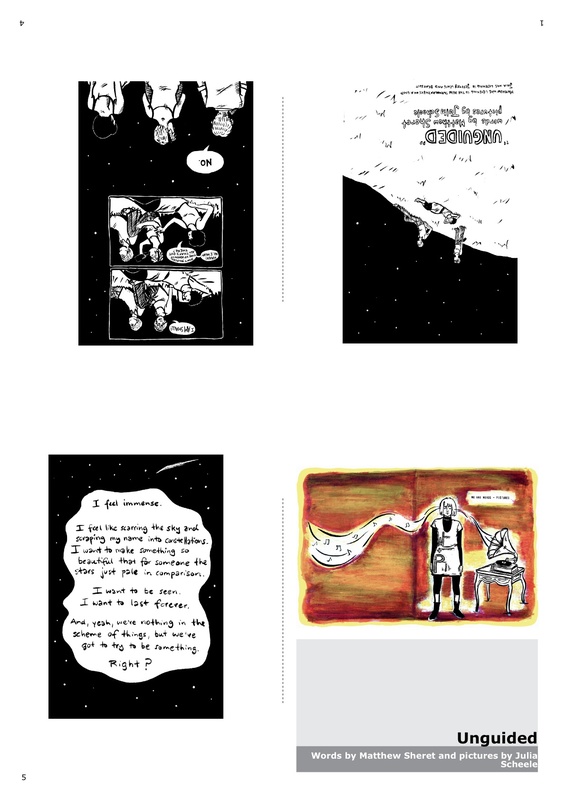 With content just a link away I turned to a story the We Are Words + Pictures team created for an anthology earlier this year. Unguided was another speedy job, knocked up in less than five minutes. Finding the source images was just a matter of dropping links into Bookleteer’s interface. The end result was admittedly rough and ready – I’d done it without much consideration of the effects of shrinkage on the A5 illustrations – but the story is still very much intact. 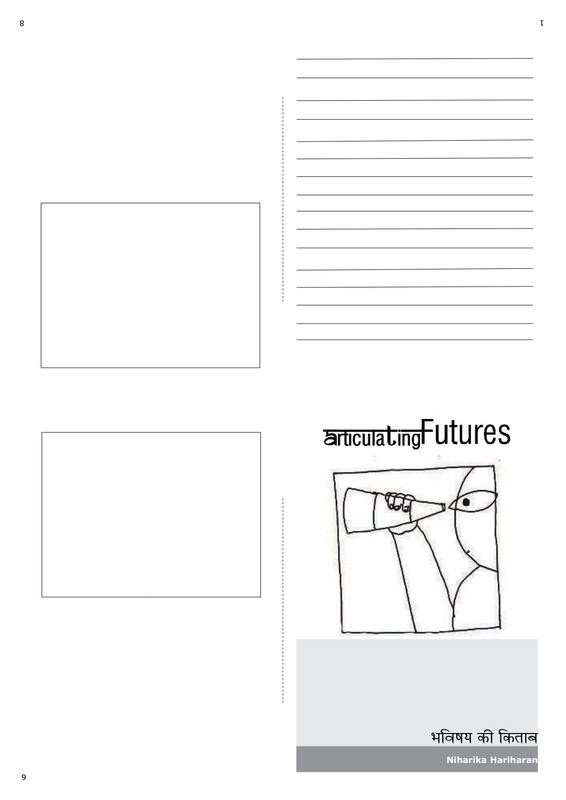 It would be the work of ten minutes to optimise the images, and an easy design decision next time to say to an illustrator “Okay, let’s go for an A6 format” which is the kind of space a panel from a webcomic could thrive in. 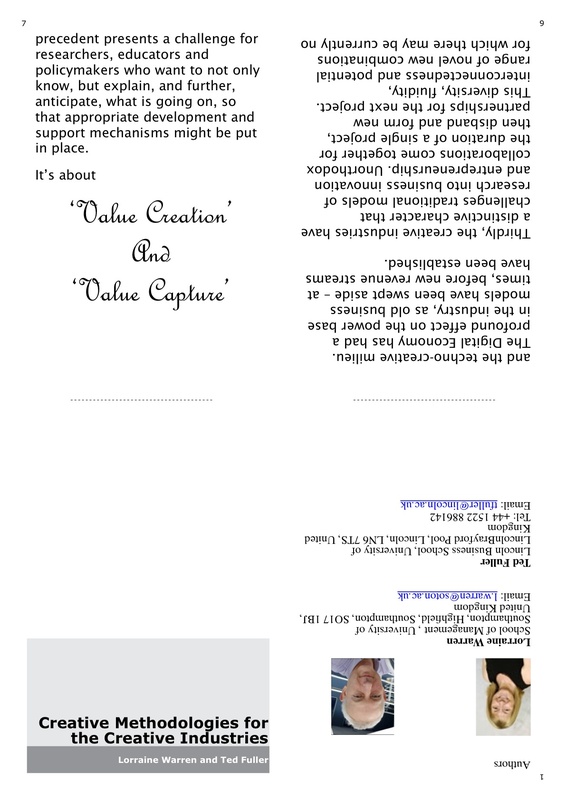 About : Lorraine Warren and Ted Fuller have created this eBook to capture some of the key ideas about their research in value creation in the creative industries and to use in participative workshops and conferences. Dr Lorraine Warren is a Senior Lecturer in Entrepreneurship and Innovation and Director of Postgraduate Studies in the School of Management at the University of Southampton. She is interested in the emergence of new technologies, particularly how new business models and value creation systems emerge in volatile sectors. Professor Ted Fuller is Director of Lincoln Business School. His research interests span entrepreneurship and Small and Medium Enterprises, emergence and a ‘complexity’ theory of entrepreneurship, and the (social) construction of futures. 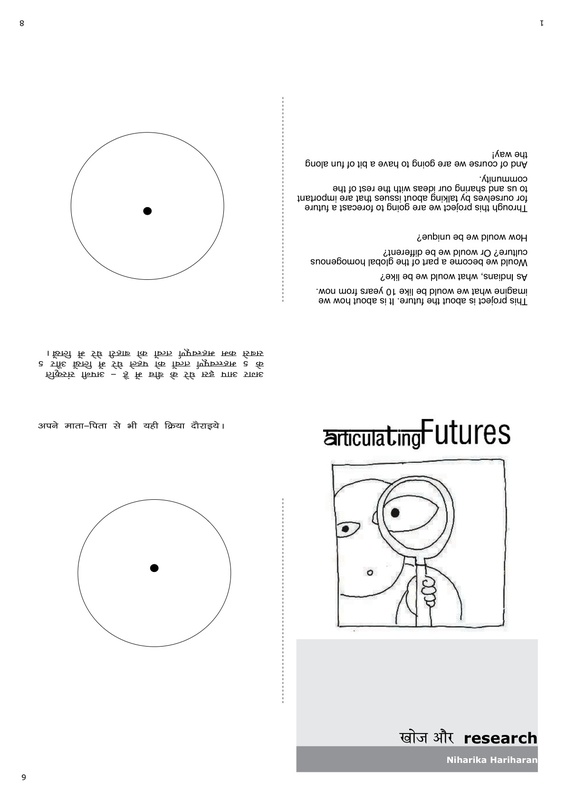 About : Articulating Futures is a 4 day workshop that was designed and facilitated by Niharika Hariharan, commissioned and creatively supported by Proboscis (London) to mobilize young students to creatively think and articulate issues that are important to them and their future as young Indians. The first series of these workshops were held at Chinmaya Mission Vidyalaya, New Delhi between the 17th-20th November, 2009. These eNotebooks were created to help the students organise and share their ideas across the workshop, combining English & Hindi. 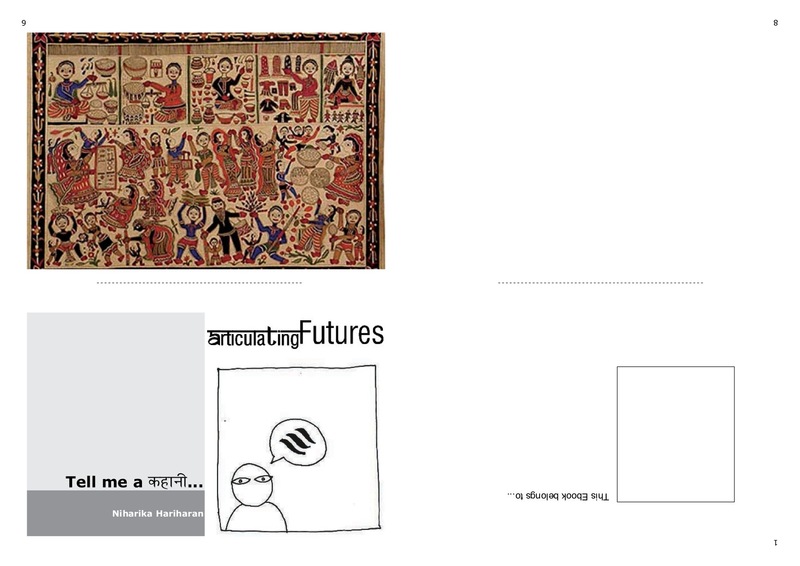 Working in collaboration with tutors, filmmakers and artists, Articulating Futures investigated subjects ranging from the change of identity of young Indians, their views on language, traditional cultures and the importance of a global/local societies. Through discussion, debate and creative exploration, this workshop resulted in a range of exciting and insightful ideas and scenarios developed by 16 year old Indian students that showcase their vision of themselves as unique in a fast developing homogenous culture in modern India. Niharika Hariharan is a narrative designer and a filmmaker, keen on working and exploring the intersection of design with related and non-related fields such as sociology, sciences, education and traditional knowledge systems. She has worked on numerous multi-disciplinary projects in the realm of social and community design, developing innovative research methodologies, scenario building and story telling techniques. Niharika was awarded the ‘TATA scholar’ in 2007 and her work has been exhibited at many national and international festivals and events. About : “A Trail Song uses a well known song or tune but replaces the lyrics with words of its own. These words reference objects, people and places experienced on the journey” (Trail Songs Magazine (1954) – The Whyte Museum Archive, Banff, CAN). 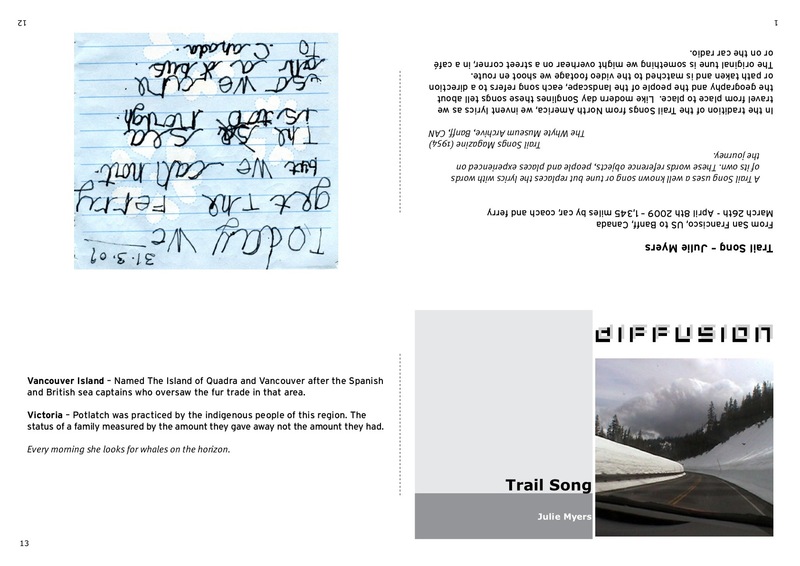 In the tradition of the Trail Songs of North America, we invent lyrics as we travel from place to place. Like modern day Songlines these songs tell about the geography and the people of the landscape, each song refers to a direction or path taken and is matched to the video footage we shoot en route. The original tune is something we might overhear on a street corner, in a café or on the car radio. Julie Myers is an artist and lecturer and lives in London. 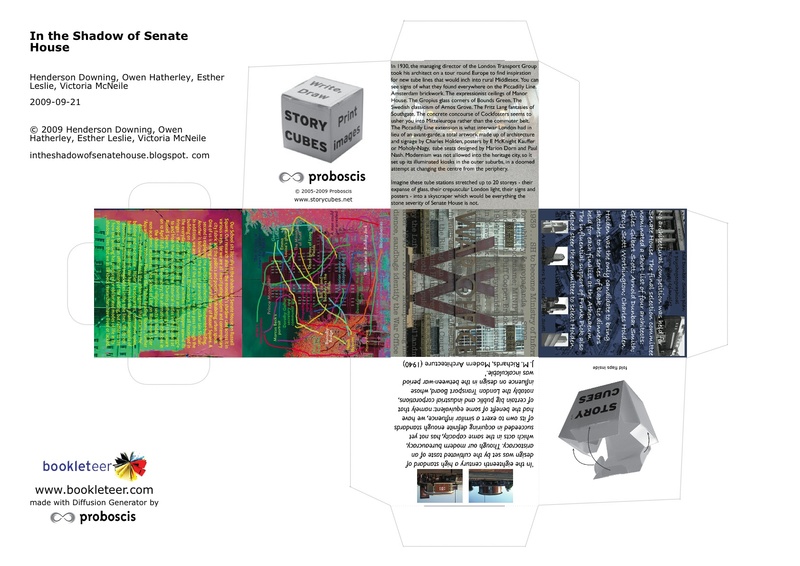 Using technology as a way of mediating social interactions, her work is concerned with space and place, collective knowledge and shared experience. 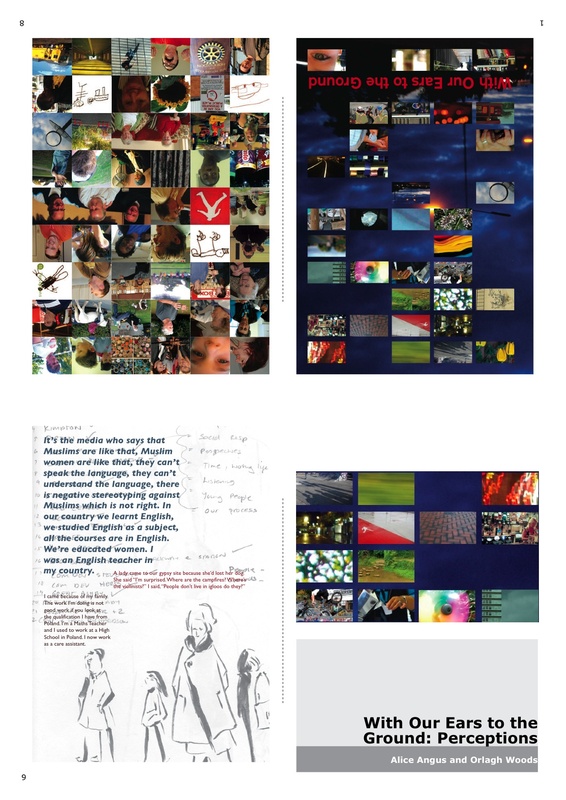 Previous work has been commissioned by Arts Council England, NESTA, The British Film Institute, The British Council, AHRC, The Institute of Contemporary Art and The National Portrait Gallery, London. Industrial collaborators include, Adobe Systems, USA, British Telecom, UK and Philips Multi Media, FR. About : BlakeWalking is a new way of conversing, participating, publishing, performing & *creating* on the hoof. The aim of Blakewalking is to Transform an everday walk into a *Visionary Experience*. We want you to join us out on the streets, on the web & on your mobile – making notes, recording thoughts & feelings, responding to the world we walk through – and the world *within*! See http://www.timwright.typepad.com/L_O_S for more details. Tim Wright is a digital writer, a cross platform media producer and a director of XPT Ltd. See www.xpt.com or follow @moongolfer on Twitter. About : Several years ago, Linda Carroli relocated to the outer northern suburbs of Brisbane, Australia. During this time, as a result of this experience, she was moved to commence postgraduate studies in urban planning and design. 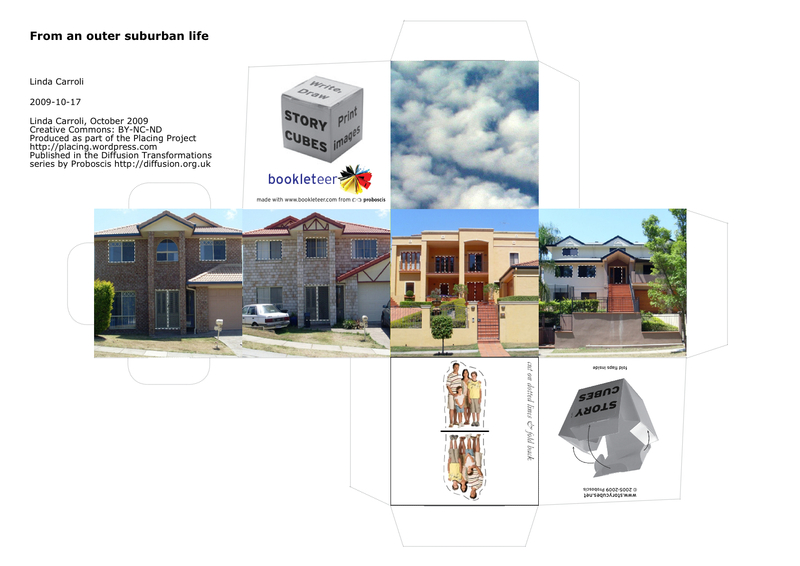 Her local area bears all the hallmarks of outer suburban development and in this spatial complex she is considering how this pattern shapes us as individuals and shapes our communities. 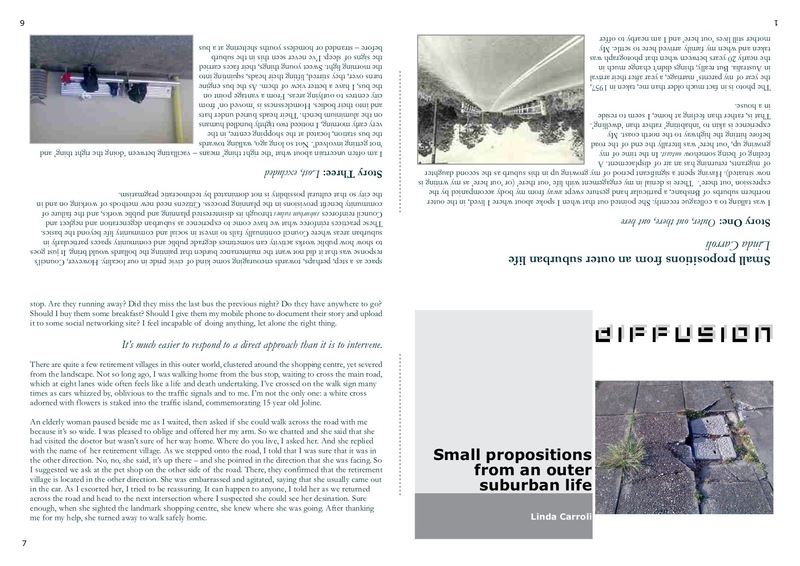 With reference to notions of ‘dwelling’ (Heidegger), ‘redirective practice’ (Fry) and ‘synoikismos’ (Ingersoll), the eBook considers local encounters, responding in small ways, in thought and act, that disrupt – and ultimately transform – the pattern of suburban life. If we transform the suburbs and our way of thinking about them, can we transform ourselves and bring new futures into the realm of possibility? Can community and gathering displace consumerism and retreat? These works reflect on such transformative potential through experience and through relationships between self, community and place. 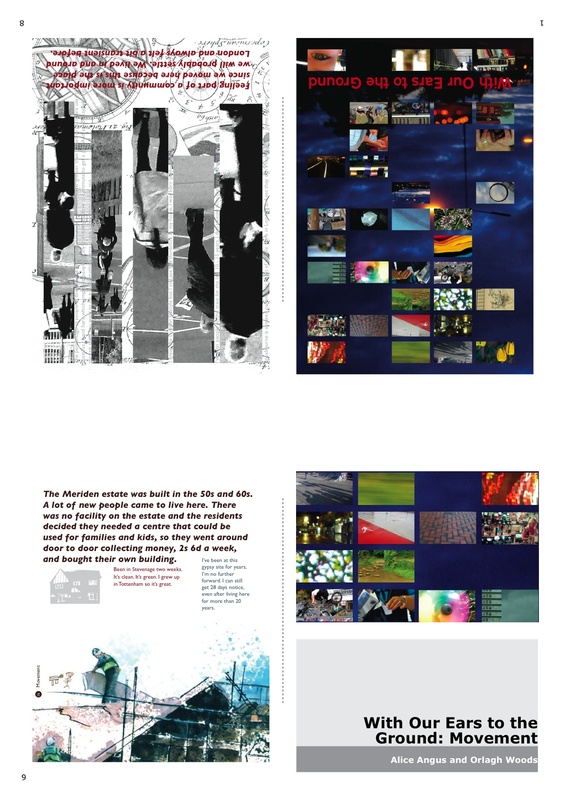 About : Fragments towards an anarchaeology of Belo Horizonte is a series of eBooks created as part of Proboscis’ contribution to arte.mov festival and symposium 2009. Very simply the aim is to offer an outsider’s eye on some of the outstanding features of the city by going for a series of walks and photographing the things that seem particular to the city. 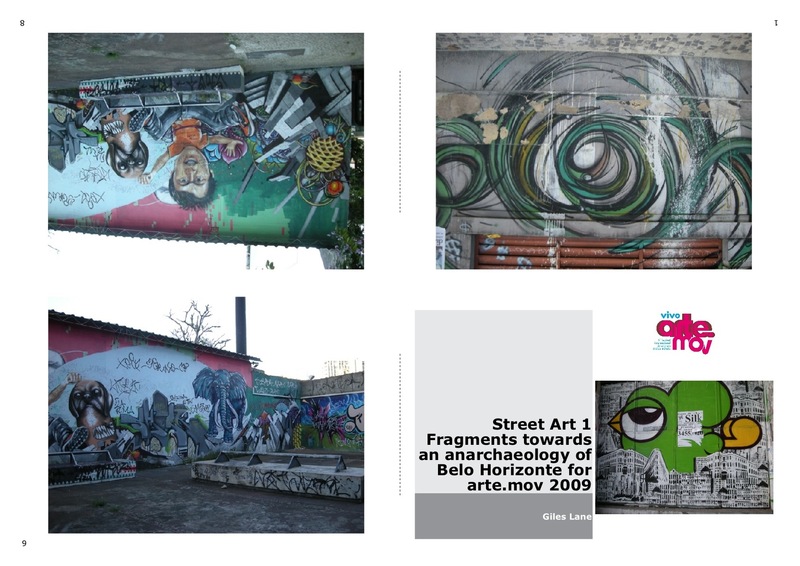 The walks were done during gaps in the symposium programme over two days, so are a very cursory engagement with Belo Horizonte, its people and life. 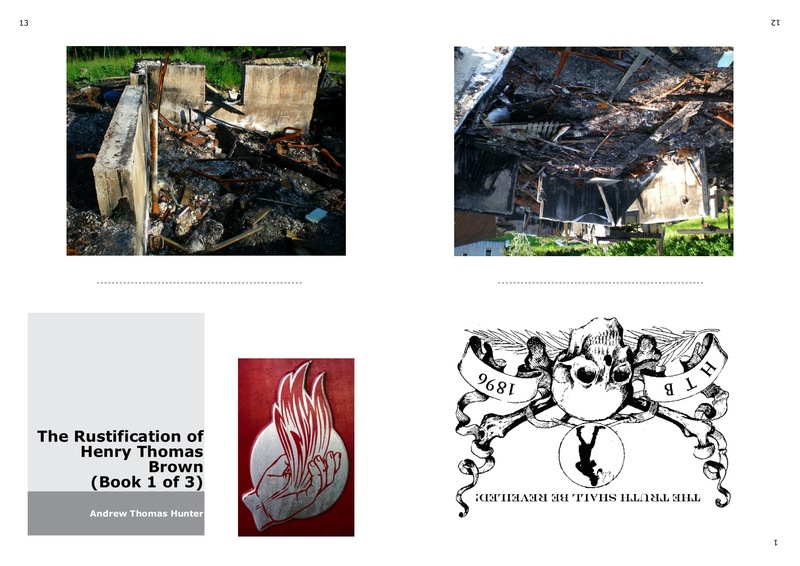 However, the patterns discerned and organised into thematic eBooks perhaps give a taste or hint of what could be revealed in a deeper anarchaeology. 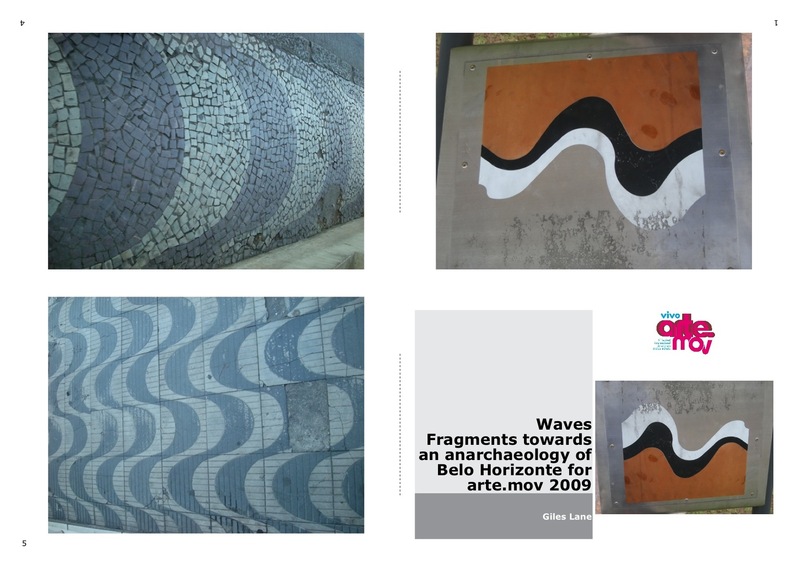 Waves – captures some examples of the use of waveforms in Brasilian design: from motifs printed on city rubbish bins, to the ubiquitous wave patterns embedded into the pavements. Corners – Belo Horizonte is Brasil’s first planned city, the central district laid out on a rigid orthoganol grid cut through by diagonal avenues. At many intersections there may be up to eight streets converging leading to numerous wedge shaped buildings, almost all with elegant curved corners. Street Art – much of Belo Horizonte seems to be colonised by elaborate street art and graffitti, on a scale I’ve not seen anywhere else. Complex artworks are sometimes run the length of an entire city block or radically transform municipal features such as bridges and stairs. These are clearly artworks, not just random graffitti – some are clearly commissioned for private or public buildings, but most seem to be tolerated if not officially sanctioned. “Fragmentos para uma anarqueologia de Belo Horizonte” é uma série de eBooks criados como parte da contribuição do Proboscis para o Simposio do Festival arte.mov de 2009. Muito simplesmente, o objetivo é apresentar um olhar estrangeiro sobre algumas das principais características da cidade, através de uma série de caminhadas nas quais foram feitas fotografias daquilo que parecia ser particular na cidade. As caminhadas foram feitas nos intervalos do simpósio durante dois dias e são, assim, um engajamento muito superficial com Belo Horizonte, sua gente e seu cotidiano. No entanto, os padrões eleitos e organizados nos eBooks temáticos talvez possam apresentar um sabor ou uma dica do que poderia ser revelado em uma anarqueologia mais aprofundada. Ondas – capta alguns exemplos da utilização de formas de onda no design brasileiro: desde motivos impressos em lixeiras da cidade, até os padrões repetitivos de onda assentados como pavimento no chão. Esquinas – Belo Horizonte é a primeira cidade moderna planejada no Brasil. O centro da cidade foi colocado sobre uma grelha ortogonal rígida, cortada por avenidas em diagonal. Em muitos cruzamentos, pode haver até oito ruas convergentes levando a numerosos edifícios em forma de cunha, quase todos com elegantes curvas na esquina. 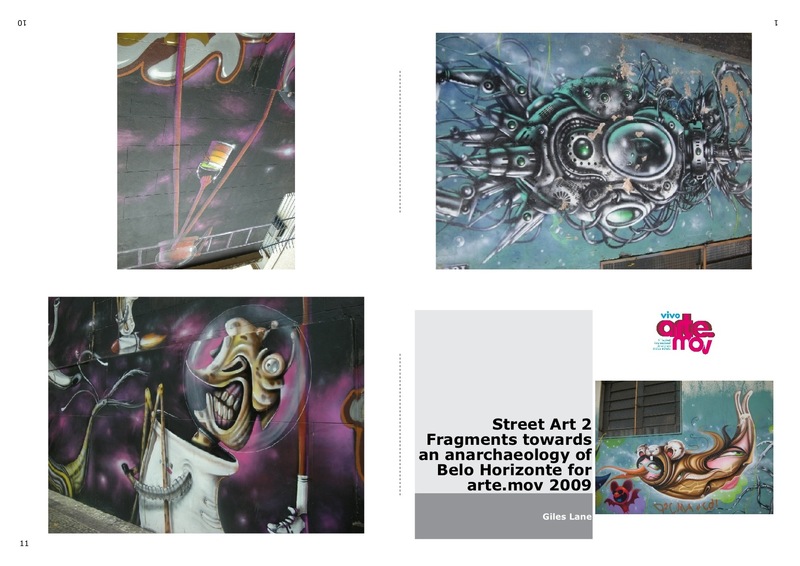 Arte de rua – grande parte de Belo Horizonte parece ser colonizada por uma arte de rua elaborada e por graffiti, numa escala que não vi em nenhum outro lugar. 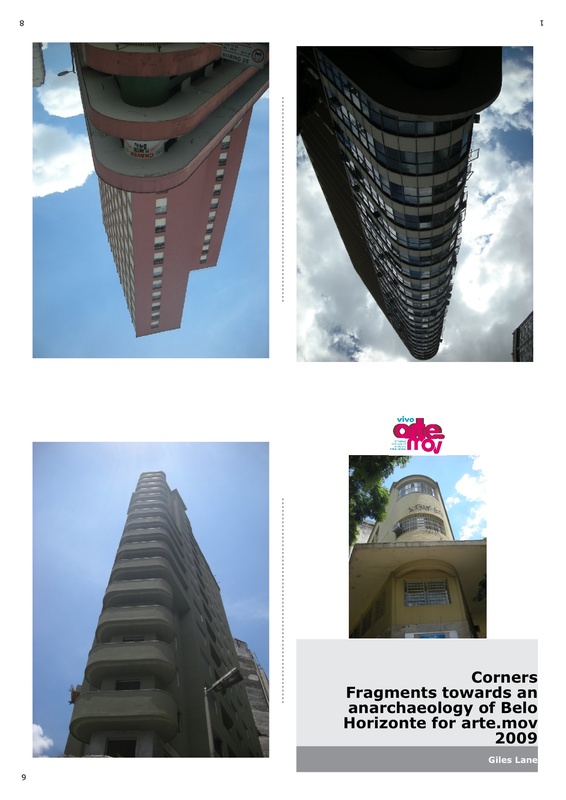 Obras complexas são, por vezes, do comprimento de um quarteirão inteiro ou transformam radicalmente obras municipais tais como pontes e escadas. São claramente obras de arte, não apenas graffiti aleatório – alguns são claramente encomendados para os edifícios públicos ou privados, mas a maioria parece ser tolerada se não oficialmente sancionada. 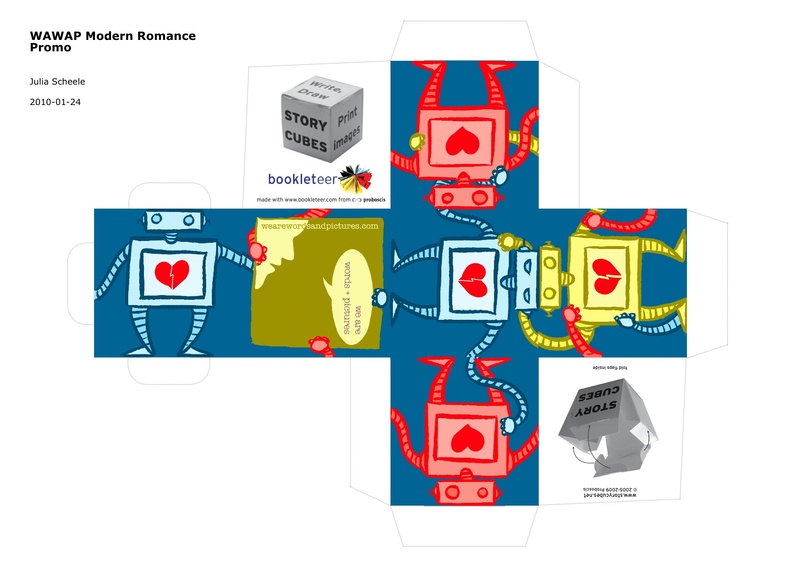 As part of our thinking into new business and revenue models for our own projects and practices, we’ve come up with a different approach for supporting the next stage development of bookleteer to relying on grants. To progress bookleteer to a public ‘beta’ version in early 2010 – we’re looking for friends and supporters (initially organisations but also individuals) to join bookleteer’s Alpha Club. The club is an alternative support/fundraising concept, aimed at partners, friends, colleagues and sponsors who share in our ethos of ‘public authoring’, providing public access to tools of creation, production and distribution and who, as members of the Alpha Club, would like to be at the core of the emerging bookleteer community. For a modest, one-off contribution we hope Alpha Club members will help us raise our target of around £25k for the next critical phase of bookleteer’s development. Membership of the Alpha Club will be exclusive to those who join during the ‘alpha’ stage of bookleteer’s development, establishing a founder group of friends, supporters and sponsors. ordinary mortals a chance to buy the same sort of gear that celebrities wear! 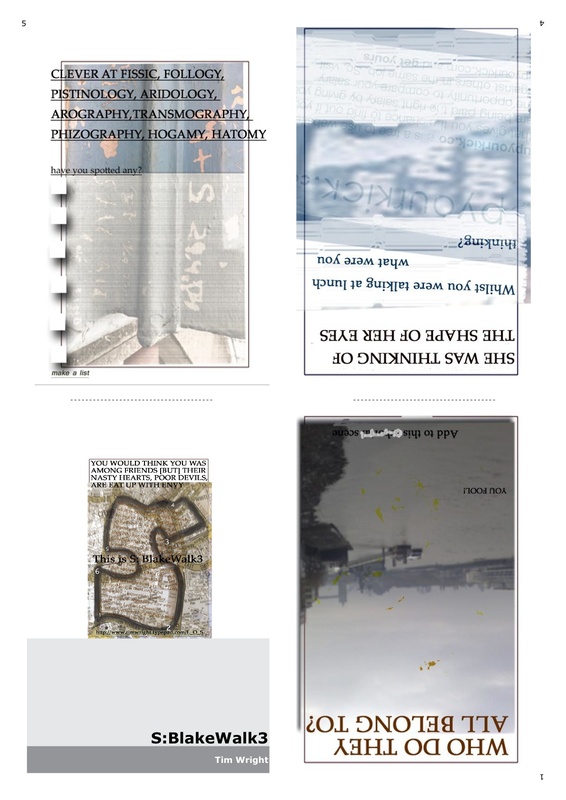 About : An A-Z of The Ting: Theatre of Mistakes comprises 16 ebooks with documents (texts, letters, photographs, diagrams, artworks) drawn from this 1970s performance collective’s private archive and from original research conducted by Marie-Anne Mancio and Jason E Bowman. 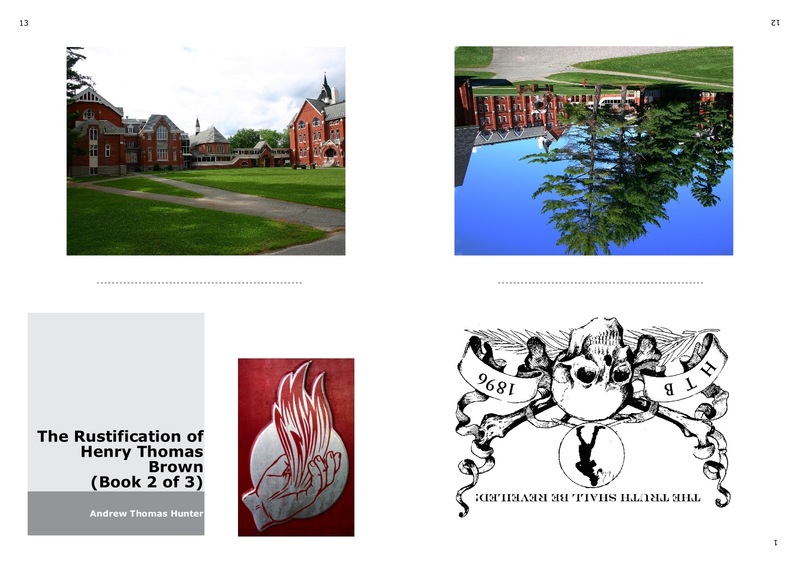 Each book has 26 pages, referencing the alphabet, however there is no more reason to begin with ‘A’ than ‘V,W,X,Y & Z’ and the democratic format of the set means entries are placed in unexpected proximity. Encouraging circuitous rather than linear, multi-perspectival rather than singular, readings and reflecting The Theatre of Mistakes‘ interest in chance, mutuality, and inconsistency, the A-Z is part introduction, part photo-essay, part-question, and part gossip. 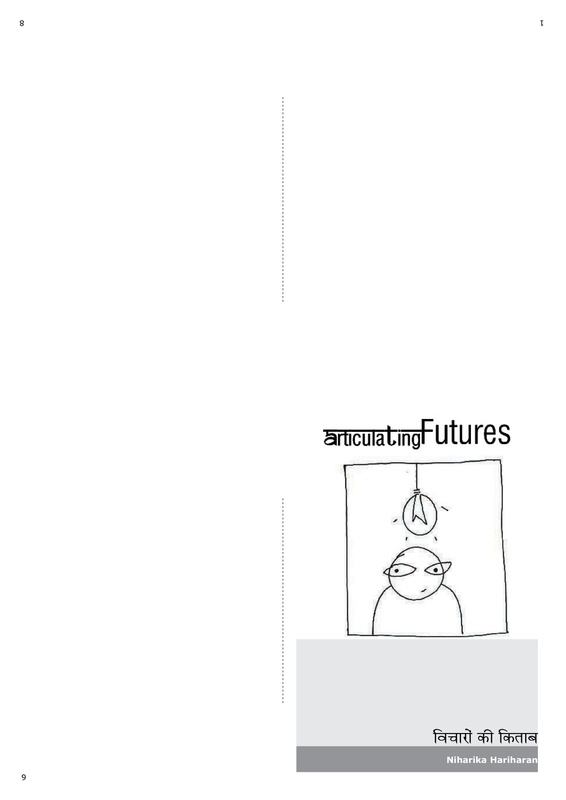 Oh Sorry, I didn't realise the stupid format is part of the art. My mistake.